It was a Sunday night and I felt like going out but dragging my guys out to eat, good luck to me with that. They are home buddies when it comes to food, and first thing they asked, with a whimsical curiosity, is "What's on your mind? Is it fancy?" This soup is a quick nutrient packed dish and I served it along with popovers. I haven't made popovers in a long while. In all honesty, I wanted to make a quick 'bread' and I love the the idea of a popovers. The technique and look as they puff up is mesmerizing, but am not really crazed for the popovers 'eggy' taste. You see the soup pictured with pitas as that is what we had with it as leftovers and hummus on the side. I kept this soup vegetarian using a vegetable stock. If you happened to miss my article 'The Malida Ceremony' published in the Hong Kong based Asian Jewish Life Magazine, you can click here for the PDF file. I cannot wait to receive the hard copy in the mail. I also am excited the magazine is available on some El Al flights. Sauté onions and garlic in oil over low/medium heat and stir occasionally until onions are translucent. Add the celery, potato, and carrots and continue sautéing for a few minutes longer until they are semi soft (al dente). Add the kale and sauté for couple minutes further. Add fresh tomatoes and tomato sauce and cook for a couple minutes. Add the beans, vegetable/chicken stock or water, parsley, thyme and salt and pepper to taste. Bring to a boil and reduce to low/medium and cook partially covered for 20-30 minutes or until potatoes and vegetables are fork tender. Stir occasionally and check for consistency desired. A wonderful soup! So comforting, warming and tasty looking. I'm so glad you posted this too! It's cold out and I could use a big bowl of soup. Looks fabulous! I'm determined to eat more kale this year, and this soup is going on my list of dishes to make soon. That is the perfect soup - just lots and lots of veg! this looks delicious! love that it is healthy, vegan, and gluten free :). and your son is still home from college? lucky you! :) hope you cherish the extended winter vacation with the family. hugs. That is so amazing Shulie. An article on a magazine plus it will be on the flight! I love this hearty soup, something I can have on a regular basis. Fancy or simple fares, you can do no wrong. Hey girlie, just looked at your link from a year ago for Fagioli. So similar only thing you used rosemary and Parmesan and I used thyme with no cheese in it. Yours looking awesome Lora!! Now this is soup! I think I'll wait til winter to give it a try but it's a definite for me. looks wonderful. Great soup I can say, since I also make a similar version using white bean but without the potatoes.They are absolutely delicious and comforting!Congrats on the article! I know! :) The base is pretty much universal. I think if I put petite pasta shells it would me more of a minestrone. I never thought of it before my son pointed it out to me but it truly had that Whole Foods Minestrone flavor. What a healthy hearty soup - I love kale in winter soups! I make similar soup sans the kale all the time during the winter especially but this winter I went kale and chard crazed. You can see chard and kale chips in previous post. I bought so many bunches of kale within the last few weeks that I don't recall ever buying so much in my lifetime. I am happy I discovered an enthusiasm for kale as it is packed with nutrients. 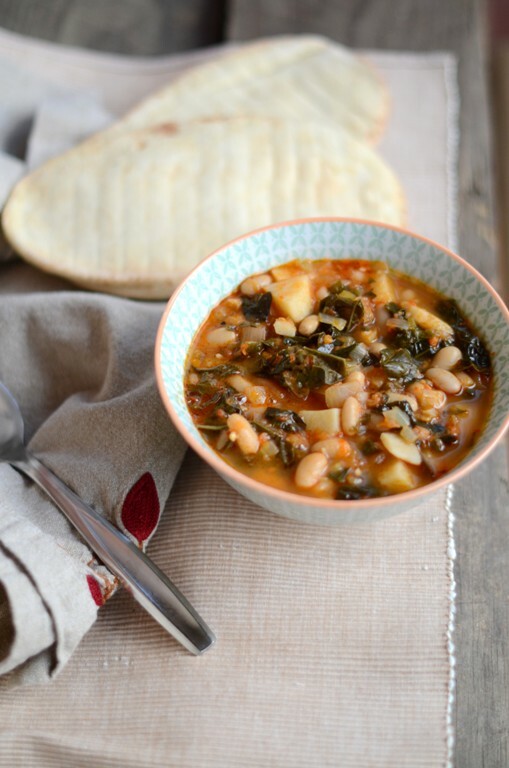 This looks like Food 52's Ribollita soup from Lidia Bastianich! This soup is very similar to many others. Basic onion, celery, garlic, carrot, tomatoes and herbs. Nothing innovative about that but necessary ingredients for any soup base. This is same base I use for other soups I make unless I make Indian, Asian or other ethnic soups. For chicken soup consomme I don't add the tomatoes. In Moroccan couscous soup I add cilantro and fennel. It is very similar to my friend Lora's see above comment, Fagioli soup as well, she published a year ago. Only thing she used rosemary instead of thyme and Parmesan which I never use in my soup. First time using kale for me I sauteed it a bit to get it to give and blend but it is a hardy leaf. Next time I would appreciate you leaving your name!! As soon as I saw the picture I - literally - sound out loud, "That looks SO good!" What a terrific soup! Thank you so much! :) It is a comforting one for cold winter days. Hmmmm, I love this soup, I can't remember when was the last time I had it. I know it's a soup but I like to have it with bread than with the spoon. Just great! I love kale but i don't know why I haven't yet used it in a soup so thanks foe sharing! A lovely and hearty soup indeed! This is a beautiful, healthy, and hearty soup! I've saved the recipe and plan to try it on Saturday, when my boys (husband and son) will be looking for something hot and nourishing. What I love most: it's a simple recipe with nourishing, wholesome ingredients. Kudos! This soup looks wonderful. I think we might make it tonight! Congrats on the article Shulie. Wow, it will be on flight too. That's something great and I am so proud of you. The soup looks so hearty and filling. I love kale and have experimented few Indian dishes with it and they turned out pretty good. Whether a minestrone, fagioli or vegetable soup, it's warm and comforting and exactly what we crave at this time of year (in the Northern Hemisphere anyway). Congrats on the article, Shulie! Awesome recipe! Will definitely give this one a try!! Once again amazing! This looks wonderful - so hearty and delicious, perfect for chilly evenings! Looks so delicious and hearty - a true winter dish! This soup has delicious and comfort written all over it. Just perfect for this time of year. Craving this soup now. Looks spectacular!